A good friend shared his love of chamomile tea with me and all of its health & beauty benefits. Once I got over the surprise of his love of tea and his vast knowledge on the cozy cup, I began looking up the benefits and was amazed. I have been devoted green tea drinker but as I drink it every morning, I like to have something different in bed before I sleep. So I started with my first cup recently and it going to be a nightly routine. Check out the benefits below and try it out. 1. Period pains: A cup of chamomile tea can relax the uterus muscles and stop them cramping during a period. The tea releases glycine, which eases the muscle spasms. 2. Sweet Dreams: Chamomile tea has a natural and gentle sedative, calming effect, so a nice cup of warm chamomile tea at bedtime will relax you and help you to sleep better. 3. 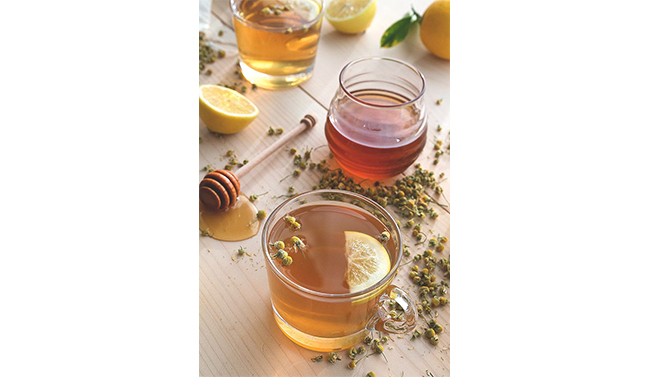 Easy on the Stomach: Chamomile tea can be used to treat a number of stomach disorders. It soothes and eases stomach aches and aids the digestive system. 4. Go Natural to Fight a Cold: Drinking some chamomile tea will make you feel better, boost your immune system, and its antibacterial properties will help clear up a cold much quicker. 5. Diabetes: Regular consumption of chamomile tea has been shown in studies to help prevent the progression of diabetes onto further complications. Chamomile tea also can be used to help control your blood sugar levels. (Always check with your MD first!). 6. Migraines: Those who suffer from frequent migraines have reported that drinking the tea on a regular basis has drastically cut the frequency and the severity of the migraine attacks. 7. Move over Cucumber Slices: Chamomile tea benefits aren’t limited to only internal use, you can also use chamomile tea externally to reduce dark circles and eye puffiness. If you are using chamomile tea bags, then save the used ones, cool them down and place over your eyes for a while (5-10 minutes is usually enough). 8. Skin treatment: Chamomile tea has antioxidant, antimicrobial and anti-inflammatory properties. As already mentioned, it can be used both internally and externally; you can use cooled down chamomile tea as a natural face toner, mix it with other ingredients to prepare homemade facial treatments or use it as a natural, refreshing face mist. Applied externally, chamomile tea will reduce skin irritation, can help alleviate itching and skin rashes, accelerate healing process of acne scars, breakouts, sunburns and minor wounds, it will nourish and rejuvenate the skin, adding a beautiful glow; thanks to its anti-oxidant properties, chamomile tea can also help fight aging; and when you drink it, it will nourish and hydrate your entire system from within and help fend of the allergic reaction. 9. Chamomile tea hair rinse: Chamomile tea can also be applied on your hair as a final hair rinse (make sure that the tea isn’t hot, wait for it to cool down before applying to your hair, the temperature should be comfortable to touch) or it can be added to various hair masks and homemade hair treatments. Not only camomile tea hair rinse will help fight dandruff, sooth scalp irritation and nourish your hair, but it can also add beautiful shine and golden glow to otherwise dull looking locks. If you use chamomile tea hair rinse regularly, it can also gradually and naturally lighten your locks. Chamomile tea benefits are numerous, but you should be wary of drinking too much of it, as it can also upset you your stomach and cause diarrhea. You should also avoid chamomile tea if you are pregnant, as it can act as a uterine stimulant. Do you know of any other benefits from camomile tea? Please let us know in the comments below.